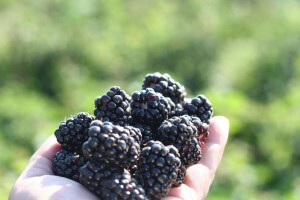 This is one of our first U-Pick crops of the summer season, starting at the end of June or beginning of July. It’s also one of our fastest picked, usually lasting only about three weeks. We added a few more rows of berry bushes in 2012 in the hopes of extending the harvest to more pickers. Our blackberries are on line vines without too many thorns, which makes them very picker-friendly. One of the varieties we have (olallieberries) are completely thornless! When at their ripest, our berries are full of sweetness and juice, likely to turn your fingers purple! We don’t use any pesticides or chemicals on our berries, so they are all natural, and wonderfully yummy! As with all U-Pick fruit, we never know how many guests will arrive to pick on any given day, so the availability of the crop will vary over the season.